Troll 2 is a truly abysmal film, so much so that a cult of screenings, merchandise and even conventions has been built around it, driven by young film buffs' desire to watch it again and again and guffaw at its utter awfulness. Best Worst Movie explores this world and how it has affected the lives of those involved in making Troll 2, in a funny, moving and quite wonderful documentary that delights at every turn. finished film for the first time is as heart-wrenching as it is hilarious. 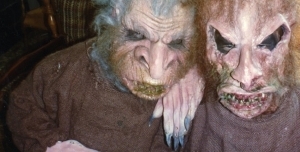 Importantly for the documentary's success, everyone who was involved in Troll 2 seems to be bursting with personality, exhibiting either a knowing and gracious amusement at the celluloid crimes they committed, or in a couple of unfortunate cases, genuine madness. One actor, who admits he was self-medicating a mental illness with cannabis during the shooting, even started thinking his part was real, quite an achievement in a film so shockingly silly. Sadder is the plight of Margo Prey, who played â€œMomâ€ Diana Waits, and seems to have slipped into agoraphobia and depression. The film tries its best not to laugh but the footage was apparently just too funny to pass up, an uncomfortable moment in the film as it's impossible not to laugh along yourself. Add Troll 2's director, the unbelievably pompous Claudio Fagrasso, and his reaction at hearing how popular his film has become and further reaction at it becoming a source of mirth, and you have a frankly astounding bunch of characters every bit as bizarre as the film they worked on. But with this is a real sense of poignancy as you see the lives they lead now, in many cases lives it's a bit too late to change and very different from what they imagined for themselves as young actors. That the legacy of Troll 2, such an embarrassment at first and something many of them wanted to wipe from their lives, has turned into such a positive thing is a heart-warming look at a deep-down desire to see the best in everything and give people a second chance. This is unnecessarily laid on a bit thick towards the film's end when letting it speak for itself would have sufficed, but it's a small flaw. This emotional depth is Best Worst Movie's triumph, and in this it has more than a passing resemblance to the recent rock documentary Anvil: The Story of Anvil, another uplifting tale about artistic failure. Although Best Worst Movie is a bit more thrown-together than Anvil and lacks its subtlety, it's a stranger, funnier and perhaps more moving film that had me laughing and crying at the same time.